The results of this effort will be demoed and published on my channel. Please shout if you think something is missing here, a device that will feel at home in this companion, I've actively hunted these for months but there must be more of them hiding in the depths of the Internet! Listed in order of appearance on my desk. Descriptions copied from respective manufacturers' websites. Yowler Roberto D. Jordan / Cat Full of Ghosts A community built DIY noise synth Kickstarter Yeah! (Github) 40106N (hex Schmitt trigger), 4070N (quad 2-input XOR) Soldered, works! 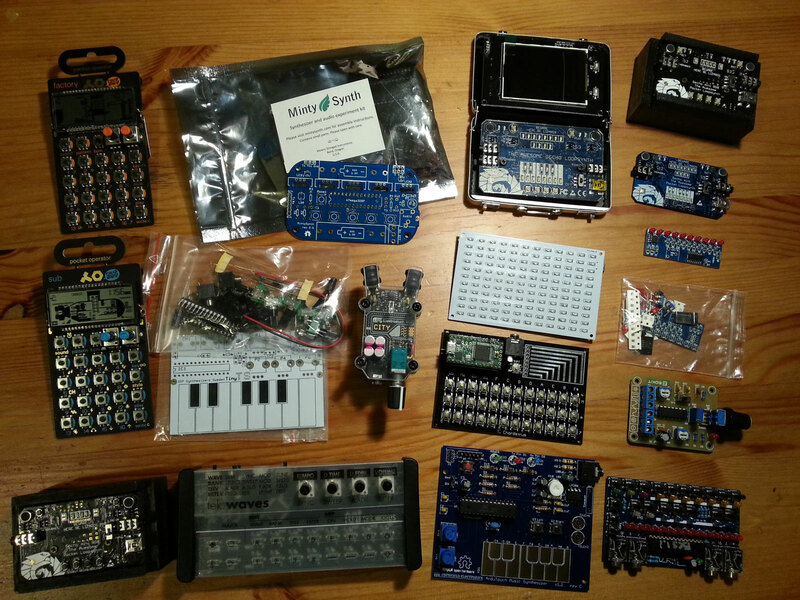 Tiny-TS Jan Ostman / DSP Synthesizers An Open-Sourced DIY Touch Synthesizer Kickstarter Yeah! (article with code) ATmega328 Soldered, works! Business Card Sequencer Division 6 Fun little sequencer, which can also be used as a tiny keyboard division-6.com Yeah! (ZIP archive) PIC16F1783 Soldered, works! T.Chordstrum Johan Berglund USB MIDI chord strummer kit for Teensy 3.2 (MIDI and built in audio output) or Teensy LC (MIDI only) Tindie Yeah! (Hackaday project) MK20DX256VLH7 (Teensy 3.2) or M26M6VFT (Teensy LC) Soldered, flashed (Teensy 3.1), works! Minijam Studio tek.waves Sebastian Heinz / Patchblocks 3 voice, 4 pattern wavetable synthesizer with arpeggiator, sequence recording and 16 sound tweaking parameters with automation Kickstarter Nah MK02FN64VLH10 Almost synced, plays nice! Groovesizer Red MoShang A DIY 16-step sequencer and granular synth groovesizer.com Yeah! (article with links) ATmega328P On the way!